It’s the time of year when people post their year-in-reviews to remind voters for the different SF/F awards what’s out there that they might have missed and which categories these stories are eligible in (especially for the Hugo Awards and Nebula Awards). 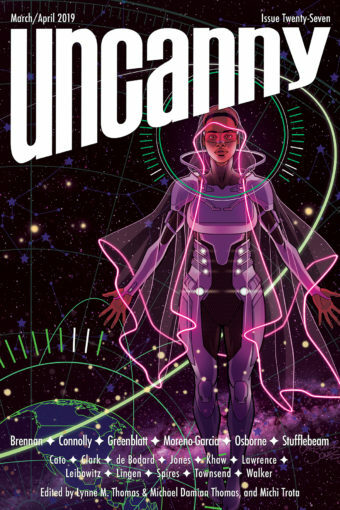 2018 was the fourth full year of Uncanny Magazine (Issues 20 through 25, including the Disabled People Destroy Science Fiction special issue). We are extremely proud of the year we had. Please also note that essays are eligible for the Best Related Work Hugo Award, and poetry is eligible for the Rhysling Award. As Uncanny is a semiprozine, all of the essays and original art also contribute towards the creators’ Best Fan Writer and Best Fan Artist Hugo Award eligibility. ETA: Here is Managing Editor/Nonfiction Editor Michi Trota’s 2018 Awards Eligibility post! And here is interviewer Caroline M. Yoachim’s 2018 Awards Eligibility post! And here is Assistant Editor Chimedum Ohaegbu’s 2018 Awards Eligibility post! And here is Podcast Producer/Reader Erika Ensign’s 2018 Awards Eligibility post!